We believe that achieving the highest possible level of employee survey participation requires a multi-faceted communications plan that is designed to generate interest and enthusiasm for the survey. 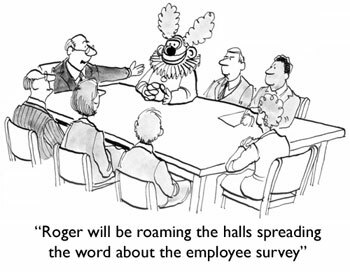 Organizations should use all forms of internal communications available to make employees aware of the survey - it would be risky to rely on only one method alone. The "ideal" communications plan should include some combination of advance notice of the survey initiative in multiple forums, encouragement from senior leaders as well as local management, email invitations and regular reminders for employees with email addresses, printed invitation letters and/or hardcopy surveys for those without emails and, where appropriate, print notices describing the survey on bulletin boards and in break rooms. Linking to a description of the survey on your corporate Intranet. To assist with this communications process, it can also be useful to create customized tools to encourage participation � as examples, we developed a survey process "FAQ" for one of our clients whose workforce consists of in-home nursing staff and, for another client, their CEO recorded a welcome message highlighting the organization's commitment to carefully reviewing the findings and making changes based on employee feedback, as well as stressing the survey's role as an opportunity to let employees' voices be heard in a systematic way. This video message was shown throughout the organization, as well as appearing at the start of their online survey and the effective use of this message helped lead to a participation rate of close to 100% among manufacturing workforce of more than 1,500 employees. If you are using an external survey company, let your employees know the name of the company and a brief description of them - this helps to reassure them that survey invitation they receive is legitimate and should be acted on. Stress that employees will be allowed to take the time necessary to complete the survey during their work day, while also informing them that they can complete the online survey on their own time if they wish. Employees must not be expected to complete the employee survey on their own time (unless they specifically want and choose to, of course) as this would undermine the value of the survey and suggests that senior management is not treating the process seriously. Reiterate that senior management has endorsed the study and is committed to taking action on the results. Repeat this message more than once, both prior to launch and during the open survey period. Make it very clear that all survey results will be kept completely anonymous and confidential - ideally, you should include a link to your confidentiality policy since some employees will want to know the specific details. Let them know when they should expect the survey invitation. Based on our experience, Tuesday or Wednesday afternoons are the best time for launching employee surveys. If you intend to release all or part of the results to employees - and we strongly believe that you should make this commitment - let your employees know this before the study starts. Employees are more likely to participate in the study if the results will be shared and they believe that positive action will occur as a result of their participation. In addition to informing all employees of the study, it's worthwhile making a special effort to reach out to your organization's managers and supervisors to ensure that they are involved in the survey process. Managers/supervisors need to encourage participation by all of their direct reports, including making whatever arrangements are necessary to let their employees give their undivided attention to the survey. If your survey uses unique access codes to gain access, let your managers/supervisors know that they should not distribute their own code to their employees and to contact the survey company for re-sending lost codes or assigning extra codes as needed. The subject of offering incentives for employee survey completion is an interesting one. In our experience, there is little need to formally "incentivize" employee participation and we've not found that individual incentives, such as entry into a prize draw, do anything to boost response rates in a meaningful way. Your goal should be to get your employees interested and excited about participating because they anticipate that positive changes will result based on their attitudes, opinions and feedback instead of participating simply because they will receive some form of incentive in return. This is not to say that, in some circumstances, incentives cannot be worthwhile. For example, organizing some form of team event - such as a pizza party - for each department that reaches a benchmark level of participation can create some extra enthusiasm and friendly rivalry. Making a donation to a company-sponsored charity, with the amount of the donation entirely dependent on the response rate (i.e. the greater the response rate, the greater the amount of the donation) can also be effective for some organizations. In contrast to the weak influence of incentives, employees are more likely to participate in an employee survey if they believe that the results will make their work lives better. The golden rule of this type of research is that, if you do not intend to act on the results, then do not conduct the survey in the first place. How easy or difficult it is for them to complete the survey. In organizations with a high proportion of "wired" employees, it should be not be too difficult to reach participation levels of 70%-80% as long as they believe their answers will translate into action. In manufacturing settings where survey data is being collected using either paper surveys or on-site computer terminals, a more structured approach - such as holding pre-scheduled proctored survey sessions - will result in much higher levels of participation than simply distributing the surveys and waiting for responses. For employee groups who are highly mobile, encourage the use of mobile devices (but keeping the restrictions we noted earlier in mind). If you have employees who prefer using their private email addresses rather than their corporate accounts, make sure you are using both addresses when sending their invitations and reminders. Keep in mind that, for better or worse, employees can have very long memories. If you've run surveys in the past and not shared the results or conducted any action planning, they may actually "punish" you by not participating. You can only overcome this distrust and cynicism by doing your best to maximize participation but, even more importantly, being extremely vigilant about taking action and communicating that action to your employees. It should not be a surprise that, to some degree, the amount of time you set for survey participation will impact your participation rate. Online employee surveys can generally be completed in a 1-2 week timeframe, although participation should be monitored in real time so as to decide when to send reminders and thereby maximize employee participation. If you are using any hardcopy surveys, then you need to carefully choose the most appropriate distribution method in order to maximum your response rate is achieved. As we noted above, "proctored" can lead to very high levels of participation while mailing hardcopy surveys to employees' homes is usually not very successful. Regardless of how you distribute your paper surveys, you should leave a two to three week period for completion, with an additional week set aside (but not advertised internally) for the inevitable late returns. This will allow time for employees who are on holiday or away from the office for another reason to participate in the survey. Consideration should also be given to whether employees on maternity leave, sick absence and contract/agency staff should be invited to participate in the survey. There is no right or wrong answer or blanket method that must be used and the most suitable method will depend on the organization, its structure and culture. More labor intensive for HR in terms of managing home addresses, etc. The focus on this section of our Guide has been on getting the largest proportion of employees to participate during the data collection stage. You will no doubt have noticed the number of times we have reiterated the need to take action as a prerequisite to participation. The next section will take a "deep dive" on the key principles for reporting, analyzing and action on employee survey findings.